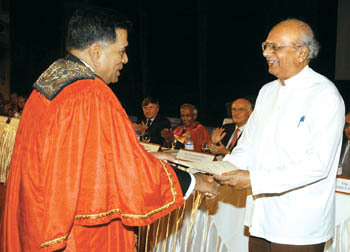 The Institute of Engineers Sri Lanka (IESL) celebrated 100 years on Friday at the BMICH. The keynote speaker at the ceremony was Science and Technology Minister Professor Tissa Vitarana. Fellowship certificates were presented to 40 engineers. Here IESL president Jayantha Ranatunga receives his certificate from Minister Vitharana. Tourists arrivals have not shown a decline despite the two terrorist attacks at Habarana and Galle during the week which many thought would cripple the country's leisure industry and other sectors of the economy. The President of the National Chamber of Commerce of Sri Lanka Nirmali Samaratunga said that since the government has many development projects, the aid utilisation is expected to be very much higher than before, especially in the infrastructure sector. Aid is now being used more proactively compared to the previous years, she said. Asia Siyaka Commodities (Pvt) Ltd., a leader in tea brokering introduced the cost effective vacuum packing machine and material to retain the quality of Sri Lankan tea.